A while back I made this needle turned wool applique picture. At the time, I was trying to show how the same design would look done in different types of fabrics - one in wool, the other in cotton fabrics. Recently I pulled this one out and realized that I had never been happy with the all-solid fabric look of it. SO, I've been working on needle felting some details into the piece. I hope to finish the new and improved version soon, and you can help me decide which way it looks best! My mom, who died last summer, was very active in local volunteer work. She gave many years of service to her local hospital, helping patients with their menus, working in the office, and offering many other types of help. Mom also belonged to a women's community group which works to raise money for local charities and scholarships for high school students. She worked every week at the group's thrift shop, making many friends along the way with her great sense of humor. Today, this group dedicated a beautiful bench at the entrance of the town's senior center to my mom. The bench is situated in front of a gorgeous flower garden. It was such a lovely tribute to her, and my heart just swelled with love and pride. When she was in her 80's, Mom spent many hours crocheting squares which later would be sewn together as lap afghans for nursing homes. I got a kick out of it when she would say, "These are for the OLD people!" My friend Andrea has reminded me (several times!) that I never finished my series of "Five Tablescapes". It has been a while coming, but here is a picture of what a table can look like while I'm working with cut paper! The picture is done with cut paper, much of it cut freehand. I'm loving all the wonderful scrapbooking papers out there, which are such a joy to work with! 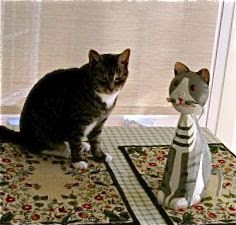 Our cat Kristy is wondering where this new feline intruder came from!! It is actually a watering can we found in a cute shop in Rockport, MA this summer. I'm trying to get geared up for a new series of faces - they should be showing up soon! Am I the only one experiencing summer doldrums? acrylic matte medium as a glue and a sealer. I have a special thing for day lilies, which Janice remembered, and she wasn't surprised that I used them as my subject. 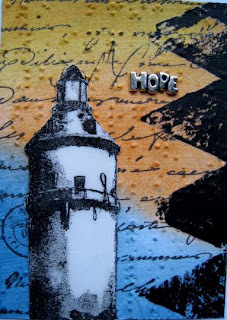 Janice's card, entitled "Light from Shore is a Beacon of Hope", is built on a braille paper which Janice has hand stamped, hand colored and embellished. The light house is cut from a stamped image and glazed. We had both begun our August cards when I visited her this week, but have yet to exchange them! During my visit, Janice introduced me to the idea of storing my ATCs in a baseball card album! I plan to cover and decorate my album - looks like I'm into a new art form!!! husband Bill in the western part of Massachusetts, where nature was lush after an abundance of rain. We have also completed two home improvements, which we had waited quite some time for. Our new porch, though small, is a peaceful little spot where we can work, relax or dine, surrounded by the sounds of chirping birds and beautiful, natural light. We live in a split level house, which came with the original wrought iron railings in the front hall, going to the upper and lower levels. This month we had them replaced with wood railings and balusters, which have made a huge difference in the appearance of our entryway. We've also begun to pull up our wall-to-wall carpet, revealing nice hardwood floors. I'll take some pictures and post them when we've completed the process. And now, amazingly, I've just had another adventure! Last night I returned from spending a few days with my friends Janice and Lorna on Cape Cod. 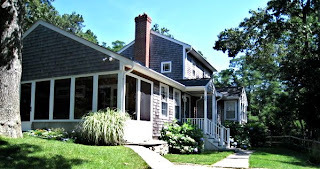 Janice, the friend with whom I've been trading ATCs, has a beautiful home (see picture above) in a charming town on the Cape. Lorna, who is quite a gourmet cook, created some wonderful meals for us, and we spent some quality time talking, eating, drinking wine and, generally, having a great time! There are lovely shops all over the Cape, and I picked up some pretty items for my new porch at home. It was nice to have time with each other, and I'm grateful to Janice for being such a generous hostess! With only a few weeks left in August, it really won't be long before the leaves start to turn and autumn will be upon us. As for me, I plan to enjoy the rest of the summer, create more artwork, and appreciate the flowers and greenery around me while they are here. But frankly, I am an Autumn person, so I also look forward to the cooler weather, gorgeous colors, and holidays that Fall brings! That is part of the fun that living in New England brings - each season is so different and we certainly have variety in our weather patterns! I guess I've rambled on enough for today, much more than usual! Hope everyone who reads this has a great weekend! 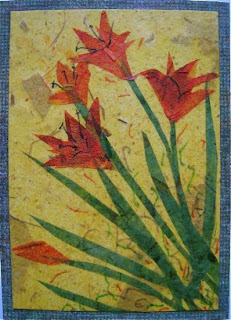 In June, I received this wonderful ATC from my friend Janice. The design is made entirely from triangles, and she has done some hand coloring in the sky. I love the crisp look of this card, and the texture of the paper. Janice's card arrived right on schedule, while I didn't get my June card to her until last week! 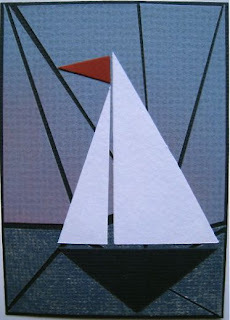 I decided to include the sailboat image in my card also, zooming back to view it from the shore. I, too, used paper, cut and torn and did some shading with chalk and colored pencil. We have exchanged July ATCs also, which I will show in a later post. Don't ask me why, but the tiny size (2"x3") of these cards seems to intimidate me, plus that always present desire for perfection! I'm working on getting over this, since it leads to all kinds of procrastination! 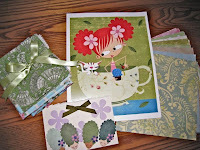 Recently, I ordered a print and some magnets from Ellia Hill at Greenbeanbaby. 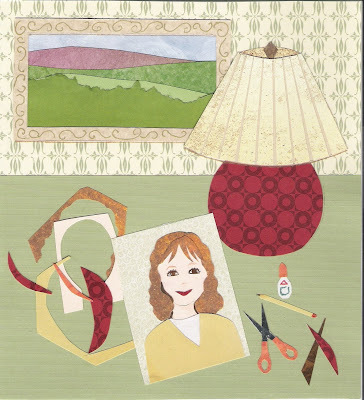 Her ideas and artwork bring forth a spontaneous response from me - a smile, a giggle and a lightness of heart! Cloaked in cuteness, her characters have their own little sweetness and a hint of slyness, and the many details in each picture are delightful. My print is called 'Margaret and her cat, Millie', and the magnets - little fairies with beehive hairdos - are too adorable! Along with my order, Ellia very generously included some wonderful fabrics and papers which I will put to good use! Can't wait to frame the print for my studio! Hello Friends! 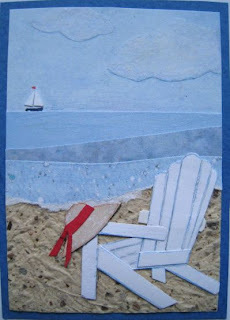 I am taking a little blogging break, but will be back to share some wonderful ATCs in a few days! Right now I am spending some time with my husband as we celebrate our 31st wedding anniversary today!!! Ah, yes, I know you are thinking, "how could those young people be married for 31 years!" This picture was taken during a recent trip to Rockport, Mass. - only about 35 minutes from our home! Today we had lunch at Longfellow's Wayside Inn in Sudbury, Mass - a tradition, since we were married right there at the Martha Mary Chapel, built by Henry Ford. Tomorrow we will be going to Lenox, Mass. where we will attend a concert at Tanglewood given by the Boston Symphony Orchestra!!! Hope everyone has a wonderful weekend! Will be back soon!